If you have a dog (or have in the past) would you say that your dog is tuned into you? Would you say that she knows when you’re happy or sad or angry? Would you say that she senses the difference between a threat and a non-threat? Service and assistance dogs astound me. So do police dogs, drug dogs, and bomb-sniffing dogs. These animals rise well above the status of “good pets” and help out mankind on another level altogether. Many of them thrive on it. However, apparently, such lives of thrill and danger can take their toll on dogs just as much as they can on humans. From a story that is simultaneously heart-breaking and inspiring, I learned that a 2-year-old German shepherd named Gina has returned from a tour in Iraq with PTSD. I won’t rehash the entire story (it won’t take you but a minute to read on your own), but the gist of it is that she left for Iraq as a highly trained but sweet and happy bomb-sniffing dog. She returned home “cowering and fearful.” She was diagnosed by a military veterinarian with canine PTSD which he says can affect dogs just as it affects people. But some veterinarians dislike applying the diagnosis to animals, thinking it demeans servicemen and women. Demeans them? Really? Perhaps it’s because I’m a dog lover. Perhaps it’s because I recently watched The Hurt Locker and the dangers endured by bomb squads are fresh in my mind. But I struggle to understand how anyone who is willing to put her life in the hands of a brilliantly trained dog, and put that dog’s life at risk in the same moment, could ever claim to be demeaned by the idea that the dog might suffer the same long term effects of warfare that the soldier herself does. If we believe that a dog can understand how to find a bomb, or how to predict a seizure, or how to find drugs hidden inside tires at border checks, then how can we consider that the same dog couldn’t understand the context of risk and danger implicit in many of those situations? I find it more demeaning to the dog to assert that they couldn’t have PTSD than to the soldier to assert that they could. This entry was posted on Monday, August 9th, 2010 at 5:00 am	and is filed under Culture, Psychobabble, Service. You can follow any responses to this entry through the RSS 2.0 feed. Both comments and pings are currently closed. Dogs are what I do in my “real life”, and I believe they can suffer war anxiety. I don’t think the enlisted men who work with these dogs would have a hard time believing they experience stress and trauma. Not do I think they would find it deeming. The partnership between dog and solider is very strong. A dog’s loyalty is put on “the line” an instinctual canine trait, which would be stressed to the max in these circumstances. I do think we have to be very careful we we apply “human feelings to dogs” Its easy to do. I do it all the time but it can get in the way of finding the pups real problem and solving it. I thought I’d give a voice to us non-dog lovers since I’m sure most comments today will be by the animal defenders. I like dogs, I grew up with a loveable Great Pyrenees that was a wonderful companion, I’m impressed by others’ well-behaved dogs and appreciate that people have a deep connection with their animals and in many cases these animals provide a mental health benefit that cannot be measured. That being said, if I were a solider with PTSD I would feel my condition demeaned by also ascribing it to a dog. I do not believe in cruelty to animals by any means, but I have much more compassion for human conditions than I do for animal conditions. It is a luxury of our privileged lives to be able to worry about the mental health of a canine. Katybeth – Thanks for this comment. I am intrigued by this idea that anthropomorphization could actually be detrimental to dogs, preventing us from assessing their conditions correctly. That never would have ocurred to me, but it makes sense. Bridget – What if it were called something else? What if it were “Canine Stress Syndrome” (or something) instead of Canine PTSD? Is it the use of the same diagnostic label that is assigned to solders that bothers you? Or do you not believe that dogs mentally respond to stress at all? I realize my post sounds kind of heartless which I don’t mean it to, but rather honest. I do believe that animals can suffer from all kinds of maladies; I’m just not wired with endless compassion for their ailments. No matter what it’s called I don’t know how much diagnosis, intervention and treatment is appropriate for an animal. I don’t have that chip that puts a dog’s well-being on the same footing as a human’s. By giving the same name to the disorder it puts the two on the same level when obviously a human’s suffering should be taken much more seriously than a dog’s. To me, discussing dog mental health and human mental health in the same terms is insulting to the humans. Aren’t dogs purposely sent into harms way in war situations because their lives (and mental health) are more expendable than humans? Until every human is given the treatment and attention they deserve (as an aside I think we way under serve our veterans in this country) I would be hard-pressed to support any attention being given to the impacts of war on dog’s mental health. Hmmm…here’s my take. I do think dogs suffer trauma. One need look no further than a really skittish rescue dog to see that. BUT…that doesn’t mean that the same energy and care should be given to doggie PTSD as human PTSD. While it’s getting better, there is so much trauma in our returning soldiers that goes unaddressed…I’m with Bridget on that one. That should be our #1 concern at the moment, but that doesn’t mean dogs don’t experience some kind of trauma. Really interesting responses here. (Bridget, thanks for following up.) I agree that far too many veterans’ conditions go undiagnosed and untreated, and that our priority in treating them should outrank the treatment of dogs. But I don’t think that the label of canine PTSD itself is demeaning to human troops. Dogs are diagnosed with cancer, cataracts, and many other ailments that humans suffer. I don’t view PTSD any differently. It’s a diagnosis, nothing more. I think it’s how we respond to that diagnosis that matters more. And this is where the argument about treatment of human veterans vs. canine veterans really comes into play. Very true, Gale. Dogs are diagnosed with cancer and cataracts and I don’t think cancer/cataract patients feel demeaned… I wonder if there’s more of a stigma because this is dealing with a psychological disorder which has been a taboo subject for so long? It has taken many generations and much education for psychiatric disorders to be recognized as “real diseases”. If I’m honest, I still say if I was a solider I would feel demeaned by comparing my post-traumatic stress to a dog, but if I were a cancer patient I wouldn’t think twice about a dog diagnosed with the same cancer. Certainly a double-standard, but one that holds true for me when thinking about this situation. Gale, this has been bouncing around my mind all afternoon. It is heartbreaking to think about these dogs who provide unique, valuable services to our society but then are irreparably damaged as a result. It doesn’t matter to me if we call it Canine PTSD, and hopefully it isn’t a matter of choosing to provide care for humans or dogs but rather both. An interesting aside: this week’s TIME cover story is about the minds of animals. It’s incredible to read what some species are capable of in terms of language, social bonds, emotions, and awareness. Eva – Thanks for the heads up on Time. I don’t have a subscription, so I’ll be sure to pick up a copy. What an interesting (and sensitive) topic. Having lived with a rescued dog as our family dog for 11 years (she passed away last fall), it was interesting to see how our family pet reacted in certain situations. She was terrified of a raised voice, and any loud noise. She was a large dog, actually defended my boys when they were little against coyotes and foxes that would occasionally penetrate our yard from the woods, but the human voice, raised, sent her cowering. We were told that it was possible she was abused at some point (she was about 2 years old when she came to us). 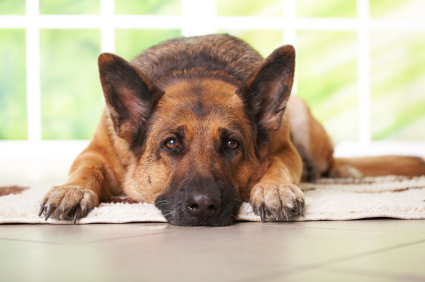 Can a dog have PTSD? I have no idea. But their ability to internalize some level of trauma or fear – noise-based, pain-based – is something that seems conceivable given the experience we had with our incredibly sweet-natured dog.